Ready to take the stage with big tone at a modest price. 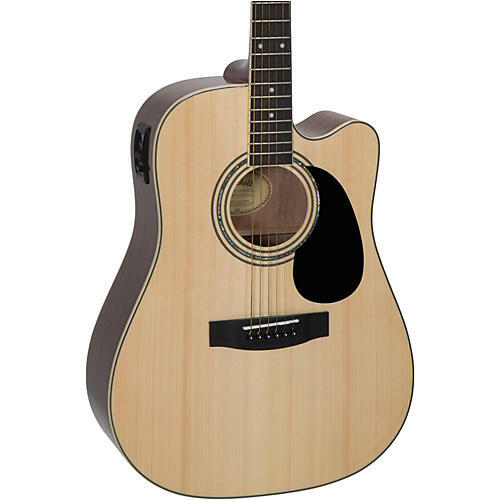 The Mitchell D120SCE Dreadnought Cutaway Acoustic-Electric Guitar gives you luscious big tone, and with its full-sized cutaway dreadnought body you'll have much easier access to the upper bout for more playability, especially if you play lead. The solid spruce top nicely complements the mahogany back and sides giving you a more sustainable organic sound, while scalloped bracing and a lighter finish provide better volume and projection. When you do go electric, the Piezo pickup and MA3T active preamp with 3-band EQ give you a wider soundscape to play around in, and the built-in tuner will keep you in tune whenever you're on stage. Either way you go, this quality hybrid will have you plucking and strumming for hours on end. Case sold separately.